SNAFU! : Heads up tribe! This book is worth reading! Heads up tribe! This book is worth reading! Hmm. How can I say this without sounding like I'm chest thumping instead of simply telling my boys about a book that is blowing my socks off? Forget the nonsense, let me get to it. You'd be surprised how many times I've gotten "asks" to check out a book and if I like it to tell my readers about it. I guess the world of military blogging is small because I've hit a few radars. If you've been here more than a minute then you know that it's not often that I get on a hilltop and scream BUY THIS BOOK! Well I'm doing that now. The Author? Never heard of him. The subject matter? 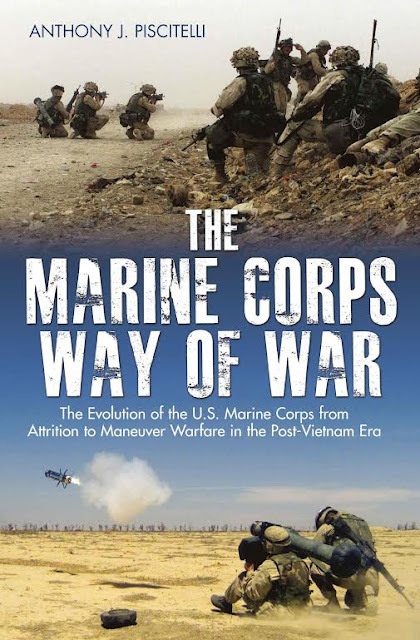 The USMC way of war...in essence a primer on how we're going from "hey diddle diddle straight up the middle" to maneuver warfare. Yeah. It touched all my hot spots. I got the book on Monday. I've been reading it at my leisure and I'm halfway thru today. I'm hooked like a crackhead and I can't wait to finish today's activities so I can climb back into it. A full review is coming but like I said. Halfway thru and I'm learning about the visionaries inside the Marine Corps that "transformed" (hate that word but in this instance it applies) the way we fight. Trust me guys. At this point it's a must buy. Full review coming soon but unless it crashes and burns in the second half this is one for your personal library.